Samsung I9003 Galaxy SL is available in Germany and India. In Germany, the mobile phone comes with a price tag of €380, while in India it costs 315 EUR via retailer Flipkart. Those not familiar with the Samsung I9003 Galaxy SL phone should know that it comes with Super Clear LCD which is cheaper than Galaxy S' Super AMOLED display. Samsung I9003 Galaxy SL has a 5MP camera, HD video recording, 1GHz Hummingbird CPU, HSPA, WiFi, GPS, Bluetooth and more. 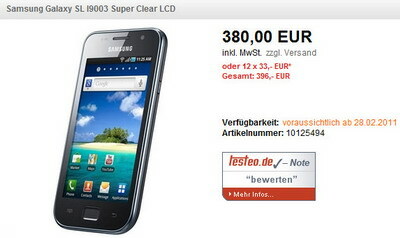 0 comments on "Samsung I9003 Galaxy SL available in Germany, India"